The official AWI World Championships will consist of the Open Overall Championship, which includes Freestyle and Toss and Catch, and Open Toss and Catch Championship.​ There will be a Freestyle Champion crowned only at the World Championship, based on the best 2 rounds of Freestyle for the day. No cash awards are presented at the World Championships, only at qualifier events, including the last chance qualifier. AWI qualifying events now include Freestyle Only Division which consists of 2 rounds of freestyle only. There will be no cut or run-off, just two rounds. This is not a qualifying event. Medals will be awarded to the top three competitors in this division. The AWI International Qualifiers consist of the Open Overall Division that includes Freestyle and Toss and Catch as well as the AWI Open Toss and Catch Division. Recreational Freestyle and Recreational Toss and Catch Divisions can be added if the Host chooses to do so. Please contact the hosting club to see whether additional divisions will be offered, and check www.ashleywhippet.com often for more updates as they become available. The top 3 finishers at the AWI Open Qualifiers in the USA will receive an invitation to the Ashley Whippet Invitational World Championship. The top 4 finishers at all International AWI Open Qualifiers will receive an invitation to the Ashley Whippet Invitational World Championships. The rules described herein will apply equally to both the World Championship Series, and any US Qualifier Events. See Europe, Asia and other international websites for additional rules. A team can qualify with a maximum of 4 dogs, maximum of 2 per division, now across all three divisions instead of 2 divisions as last year. A thrower can have dogs in all three divisions, but cannot compete with their small dog in both small dog and open divisions (can compete in one or the other with small dog, your choice). 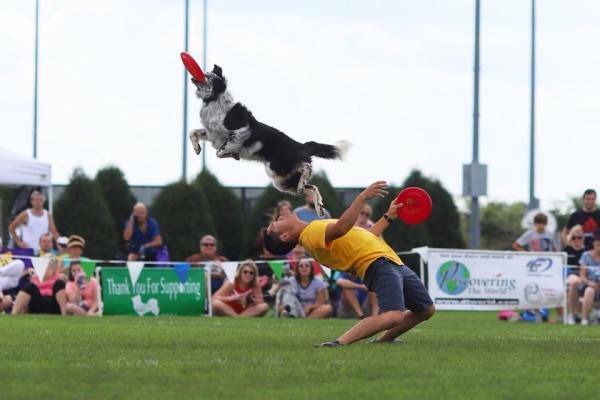 At the World Championships we will crown champions in Open Overall, Open Toss and Catch, and Small Dog. To qualify to compete at the World Championships teams must have completed a minimum of 2 scored rounds. If a team that is already qualified for the AWI World Championship plays at another Open Qualifier and places in the top 3, that invitation will slide down one spot to the next eligible team. We want 3 new teams invited from each qualifying event/division to the World Championships. If a team qualifies but can not go to World Finals, the team can not be replaced by another quaifying team. Qualified teams may win multiple event trophies but only one Qualifying medal. The times for registration opening and closing will be announced before the date of each event. Please arrive on time, or you will not be allowed to register and compete. ONCE ON-SITE REGISTRATION IS CLOSED, NO MORE ENTRIES WILL BE ACCEPTED. No substitutions of either canine or thrower will be allowed at the Ashley Whippet® Invitational once the injury/illness waiver has been signed. Pre-registration may be offered at the discretion of the host. AWI events will ALWAYS accept walk up registrations on the day of the event. Pre-registration, if available, is expected and preferred, of veteran teams. If an event host applies any ON-SITE late registration fees, please make it clear to everyone that these fees are not being assessed by AWI but by the event host. AWI STRONGLY PREFERS THAT ANY NEW COMERS TO THE SPORT NOT BE CHARGED ANY ON-SITE LATE REGISTRATION FEES. From each entry fee of the Open Overall, $10 from each team goes to the host and $10 goes to AWI. From each entry fee of the Open Toss and Catch, $5 goes to the host, $7 goes to the winner, and $8 goes to AWI . From each entry fee of the Event Freestyle, $10 goes to the host and $10 goes to AWI. From each entry fee of the Recreational Freestyle class, $5 from each competitor entry goes to the host and $10 goes to AWI. From each entry fee of the Recreational Toss and Catch class, $5 from each competitor entry goes to the host and $10 to the AWI. The money that goes to the AWI in the USA is used for things like trophies, medals, shipping of discs to each event, and costs of running the World Championship (field fees, judges, trophies, insurance, PA system, bathroom facilities, etc.). Dogs under 18 month of age used in freestyle competition with high jumps, vaults etc. Due to the risk of injury because of underdeveloped anatomy, dogs must be at least one year old to be eligible to compete in the AWI World Championship Series Open Division. 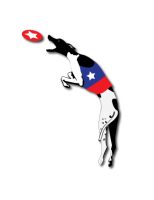 Dogs under one year of age may compete in the AWI Toss and Catch World Championship and any Toss and Catch division run at any Open Qualifier. The AWI realizes that it is difficult to determine the age of some rescue dogs, and does not want to bar any dogs from competition. The AWI requests that handlers use their best judgment in entering dogs of uncertain age, not vault dogs under the age of eighteen months ( if so the AWI will disqualify the handler for lifetime from playing any AWI event), and above all BE SAFE. Any dog friendly "pup" (smaller diameter) disc will be allowed. If a competitor chooses to use a smaller diameter disc for the freestyle round(s) the competitor may choose to use a larger disc to use for the Toss and Catch round. Any special disc requests to accommodate special needs dogs should be made to the AWI Tournament Director and will be reviewed on a case-by-case basis. At the World Championship, all Open Overall teams will complete one round of Freestyle and one round of Toss and Catch. These two scores will be added together and the field will be cut to the top 15 teams AFTER any ties have been broken. (Second-round cuts are made at the discretion of the Tournament Director and may be greater than 15 if time and other considerations permit.) These 15 teams from Open Overall Division will then run one more round of Freestyle. At the World Championships all Toss and Catch teams will run 2 rounds, then cut to the top 15 for one more round to determine Champion. If there is a tie for 1st place, a throw off will determine the Champion. The Qualifier events may run differently depending on time constraints and number of volunteers. These changes can be made at the discretion of the hosting club, head judge, and/or tournament director , but will be announced before the event when possible, but can also be announced before a divisional round starts, if dangerous weather arrives. However, in order to qualify for the World Championships, teams must complete a minimum of 2 rounds in open overall, or a minimum of 2 rounds in open toss and catch, depending on the division. The US Qualifiers include a Recreational Freestyle class with only one round of Freestyle and a Recreational Toss and Catch class with only one round of Toss and Catch. If more playing time is desired, any competitors can enter the upper divisions. The Freestyle and Toss and Catch rules and scoring described herein will be used for the AWI World Championship, and at the Open Qualifiers. Rules for any additional divisions run at the discretion of the hosting club will be determined by the hosting club. Dogs may wear standard collars on the competition field for the purpose of leash attachment. No shock, pinch, or other types of training collars are permitted on the competition field. Competitors must walk their canines on a leash to the on-deck area and when exiting the field of play. Canines must be KEPT ON A LEASH at all times, except when competing. Small dog Division is a qualifying division for the World Championships. The top three dogs at each qualifying event are eligible to compete at the World Championships. Competition consists of one round of Freestyle and one round of Toss and Catch for this division. •As in our rules for all dogs, Freestyle can only be run with dogs a minimum of 18 months old, so this age applies to eligibility for the Small Dog Division as well. Small dog is defined as a maximum measurement of 16” at the shoulder when measured on a flat surface. It is the responsibility of the Host or Head Judge to make sure this is established and enforced for all Small Dog teams participating. Division. Smaller discs are also allowed.